With all Nokia Asha 501 users desperately waiting for the phone to support the popular WhatsApp messenger, the app is now available for the phone. WhatsApp has officially made their instant messaging service available for the Nokia Asha 501 phone. Starting today, Asha 501 users can download the messenger app with a software update. The app comes with an intuitive one swipe access to the camera besides one touch social sharing features. 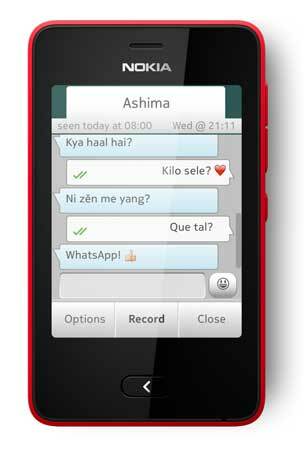 The WhatsApp app for Nokia Asha 501 also features the Fastlane home screen which can be used to track Facebook comments and likes from within the app. While the existing users can update the software through an over-the-air update, the messenger would come pre-installed in all new Nokia Asha 501 handsets from December 5. Speaking about the availability of WhatsApp on Nokia Asha 501, Viral Oza, Director Marketing, Nokia India said, “Asha 501 will be the first device on the Asha Platform to support WhatsApp. The updated software will offer Asha consumers with a more social experience, building on the previous Fastlane experience. The new interface comes with a single swipe camera, single touch share to Facebook and ability to track Facebook comments and likes right from your Fastlane screen.